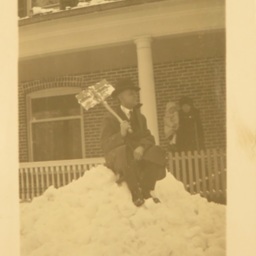 Photograph showing J.R. Miller in front of his residence in Woodstock Virginia. Hoshour Miller Photograph Album, Mackenzie Grimes Collection, 1887-1950, Truban Archives, Shenandoah County Library, Edinburg, Virginia. Unknown, “J.R. Miller,” Shenandoah County Library Archives, accessed April 25, 2019, http://archives.countylib.org/items/show/11410.